More than his contemporaries, the designer Poul Kjærholm worked with metal, rather than wood, and generally with flat strips of solid steel that were either kept straight to form frames for chairs or table or bent to shape as the support or for the runners of chairs but with the PK12 made by Kold Chistensen they used steel tubing bent to form the legs and back of the chair in a style that echoes deliberately the form and character of bentwood chairs. As with a bentwood chair the seat is formed with an enclosing hoop that sits within the legs although here the frame of the seat itself is a steel band. With bentwood the legs sit hard against the outside of the hoop of the seat and are fixed directly to the seat, often by bolts that run through the leg and into or through the frame, but here, for the PK12, there are short neat spacing pieces that are welded between the leg and the seat frame. The seat itself - in most versions covered with leather - is not round and not an ellipse but is narrower at the back than at the front so it forms what is, in effect, a rounded triangle and the spacing of the back legs, respecting this shape, are much tighter or closer together than the front legs creating a distinctive form when seen straight on and a more dynamic form when the chair is seen from other angles. The back of the chair has two curves of tube that are horizontal and parallel but not connected … the lower element curved round and then bent down to form the two back legs and an upper tube bent to form the back rest and the arm rests as a single curve and then bent down at the outer ends to run straight down for the front legs of the chair. In some versions of the PK12 the upper tube of the back is bound round with leather tape. 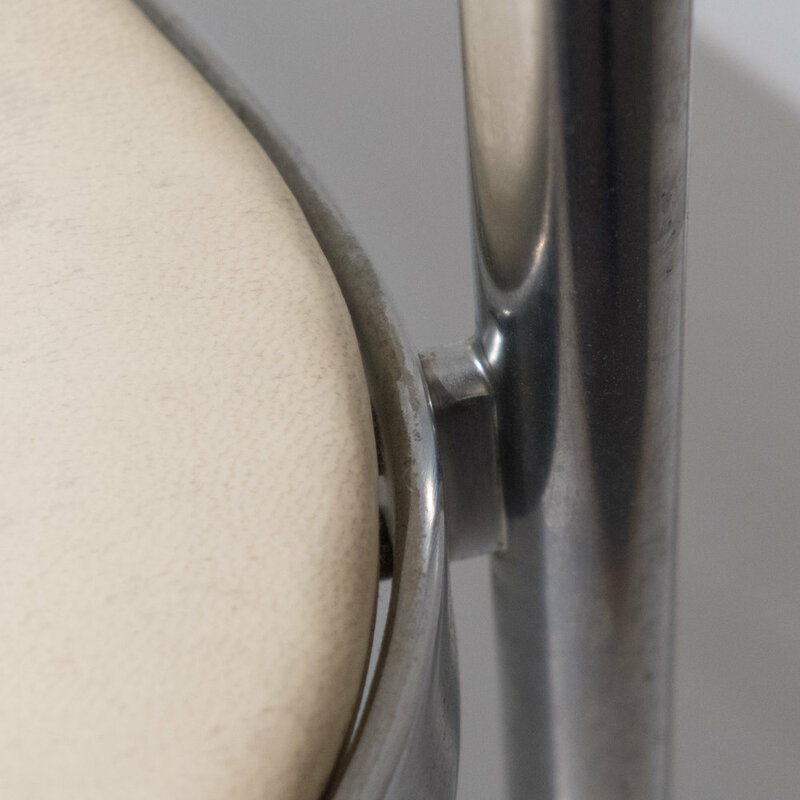 Normally chairs with vertical legs appear rather narrow or pinched and actually slightly unstable - they can be tipped backwards quite easily if the back legs are not angled or curved outwards - but here the generous width of the chair; its solid weight and the presumed strength of the steel tube together create a strong sense of stability. The chair photographed here is in the collection of Designmuseum Danmark in Copenhagen and was a prototype from 1962 but books generally give the production date for the chair as 1964. 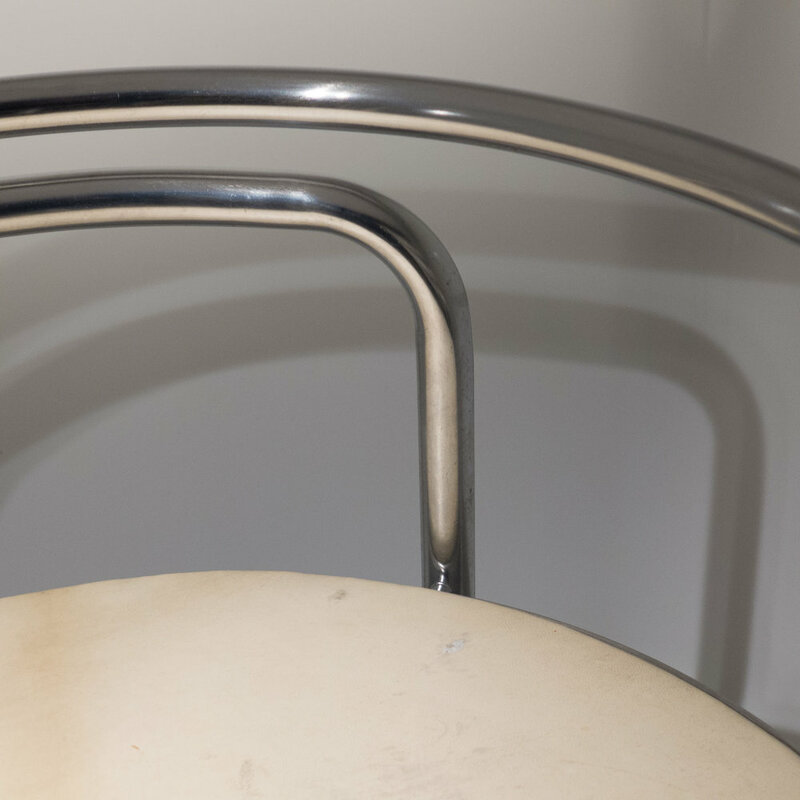 The best-known furniture in steel tube from the early modern period came from the Bauhaus in Germany and furniture in metal tube, often with a chrome finish, was popular in The Netherlands and France but the style does not seem to have been widely copied in Denmark. Although there was no major steel production in Denmark, shipbuilding was important with highly-skilled engineering work for making engines so there was certainly the machinery and the technical knowledge to work with steel tube for furniture ... so this must simply reflect a general preference for the work of cabinetmakers in wood rather than for the more industrial look of some furniture in northern Europe in the Art Deco period. 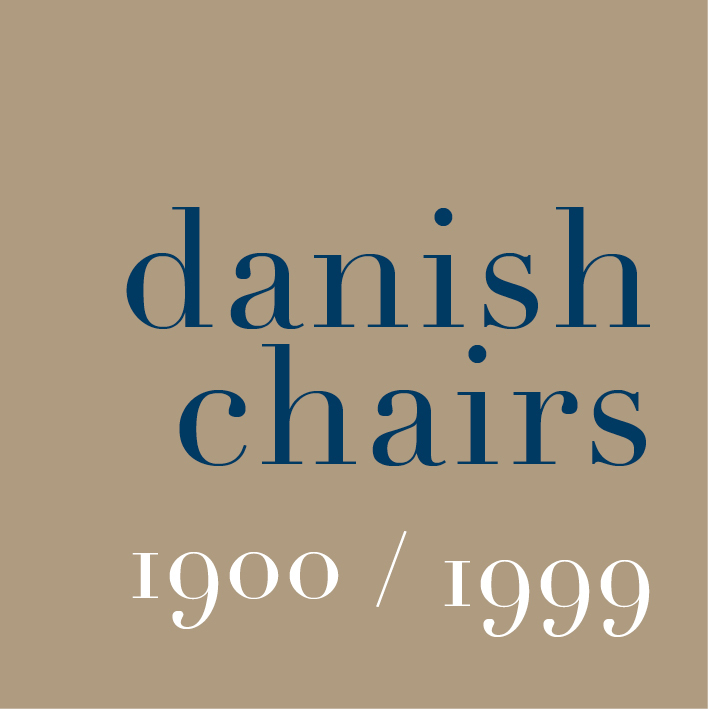 Several Danish designers did use narrow steel tube or bent steel rod for the legs of chairs and tables and there are examples of the use of bent steel tube … Mogen Lassen designed a bold chair with a tubular frame supporting a wicker seat in 1933; in 1967 Henning Larsen produced the FH9230, a striking version of a bentwood armchair in steel, and also for Fritz Hansen in the same year Grete Jalk designed an unusual upholstered chair on a bent tube frame, the FH9000. 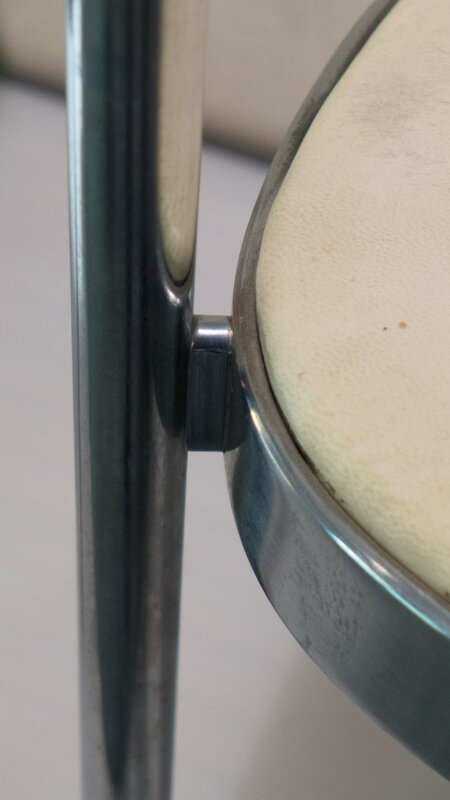 Hans Wegner used bent steel tube for the legs and the supports of the back of his office chair, the JH502 from 1955, and for the later version the JH522 from 1965 and he also used metal tube for the the Queen Chair and the Ox Chair in 1960 for Erik Jorgensen where the steel forms a base and legs for an upholstered chair rather than the whole framework. The Flag Halyard Chair by Wegner from 1950 has frame, seat and legs in shaped metal tube but in this unique design the seat and back are woven rope and the legs and the supporting frame are expressed as a separate part - by being painted - so the chair is not strictly of the bentwood / bent tube group.